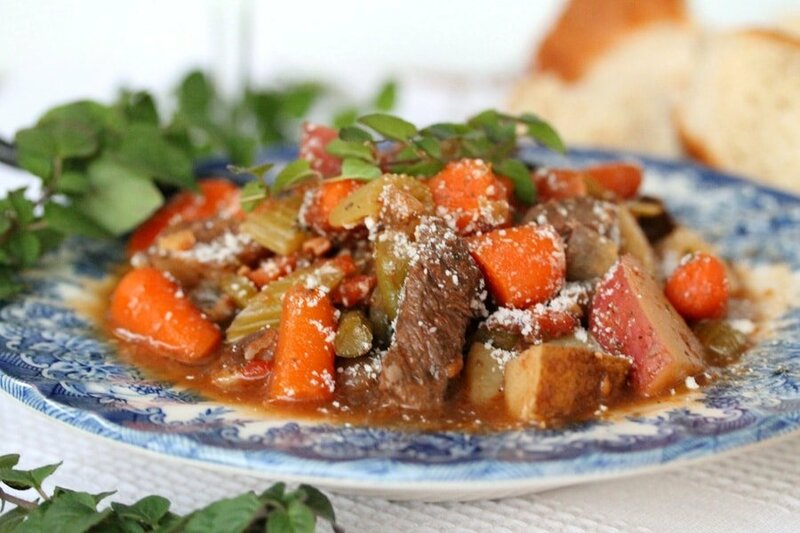 Beef stew is delicious to make year round. 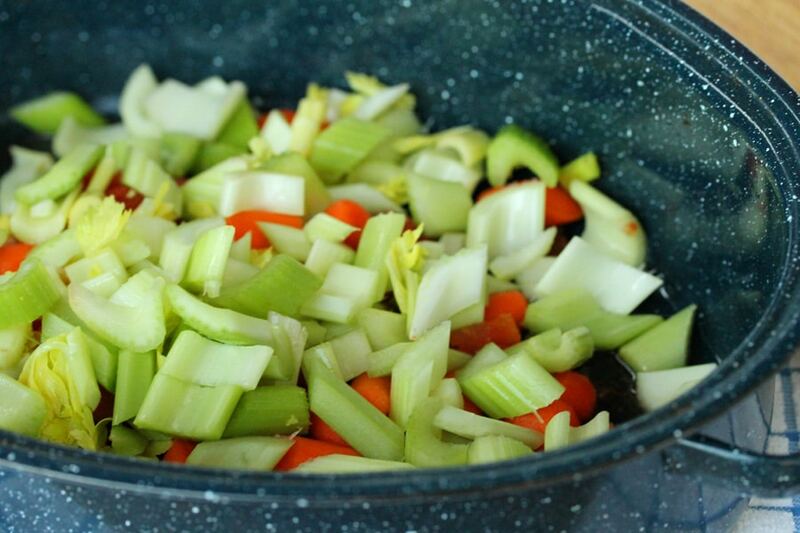 I like to make this recipe in my good old oval roaster but you can also make it in the crock pot if preferred. 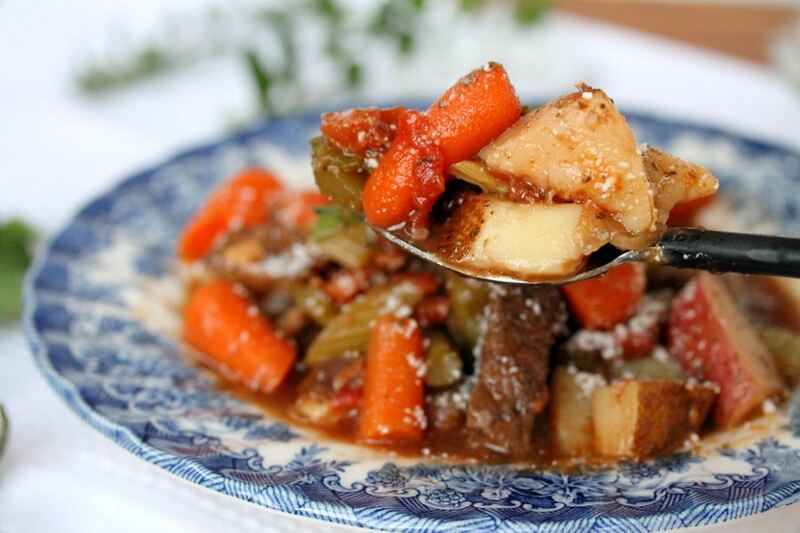 This stew includes all of the basics….beef, potatoes, green beans, celery, onion and carrot. But what really gives it an amazing flavor is the red wine and oregano. 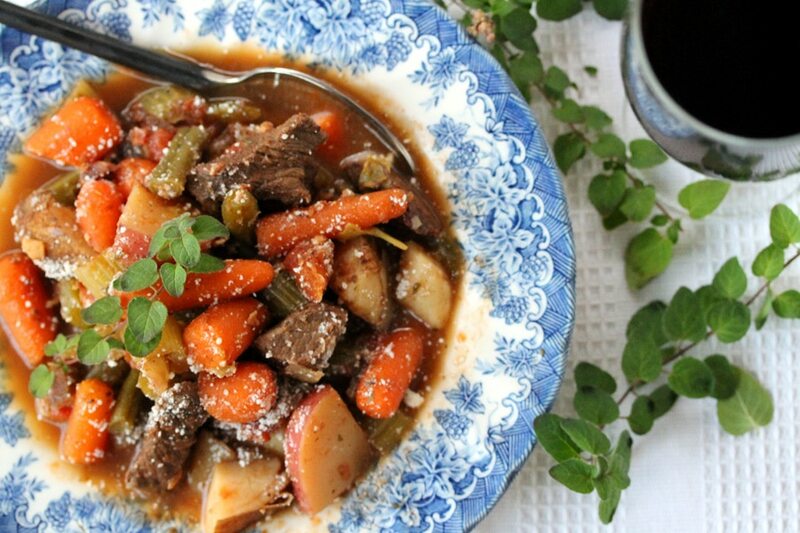 I especially like how the vegetables and beef absorb the flavor of the wine and oregano, and the end result tastes soooo good. 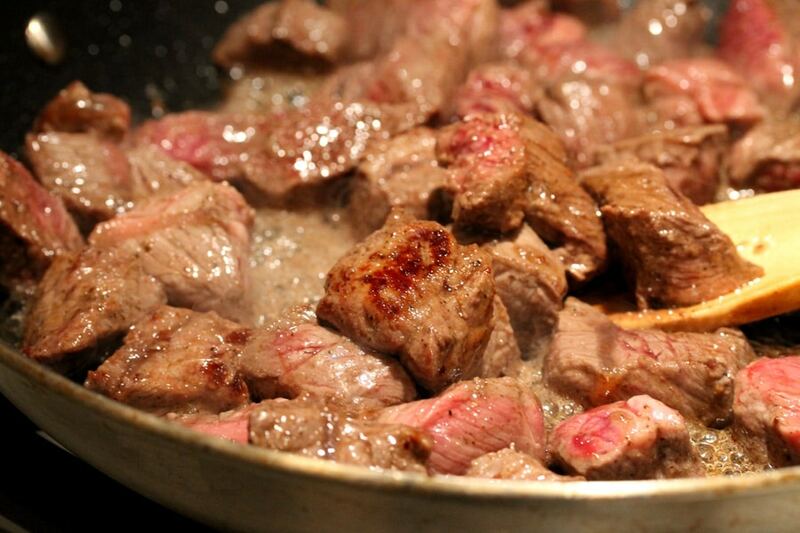 The beef is so tender that you can cut it with a spoon. 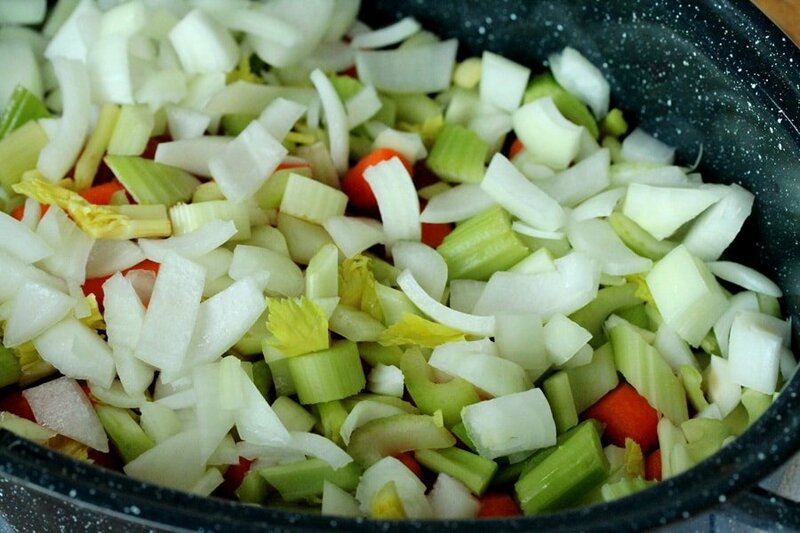 This is true comfort food, and the house smells amazing while it’s cooking. 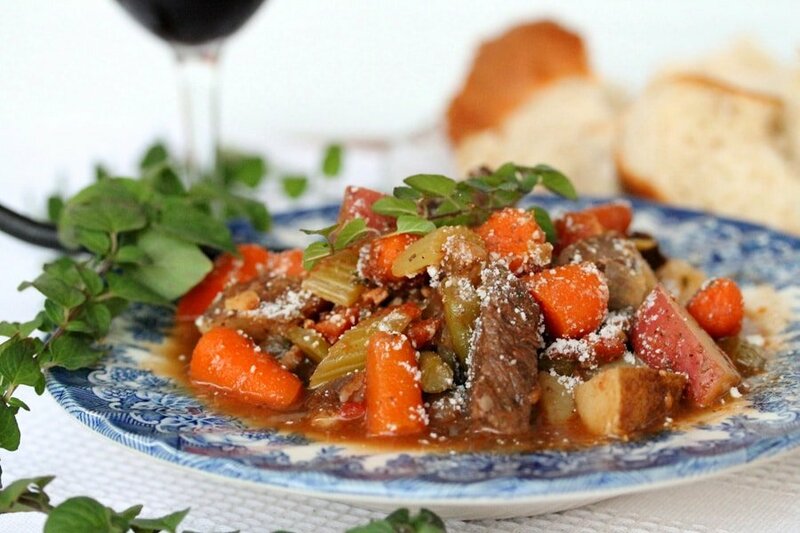 Serve this stew topped with grated Parmesan cheese, alongside warm bread and butter or garlic bread for a delicious meal. Leftovers warm up nicely too. 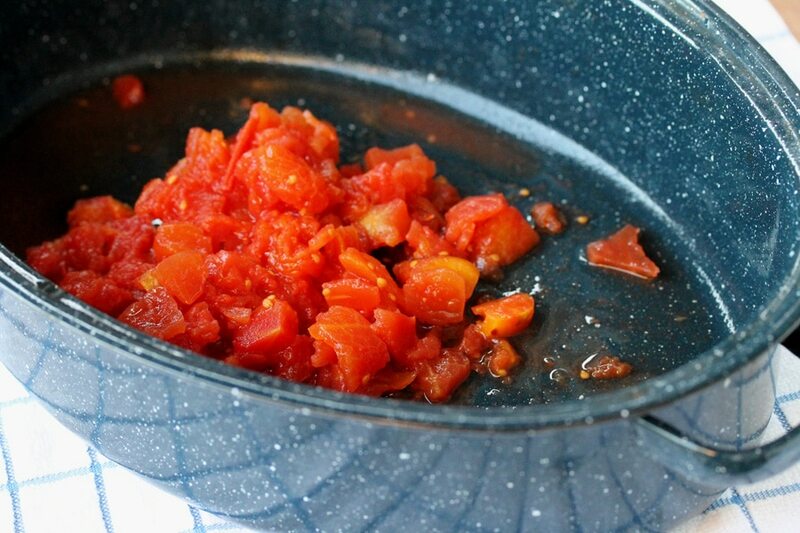 To a large roaster pan, add the canned tomatoes. 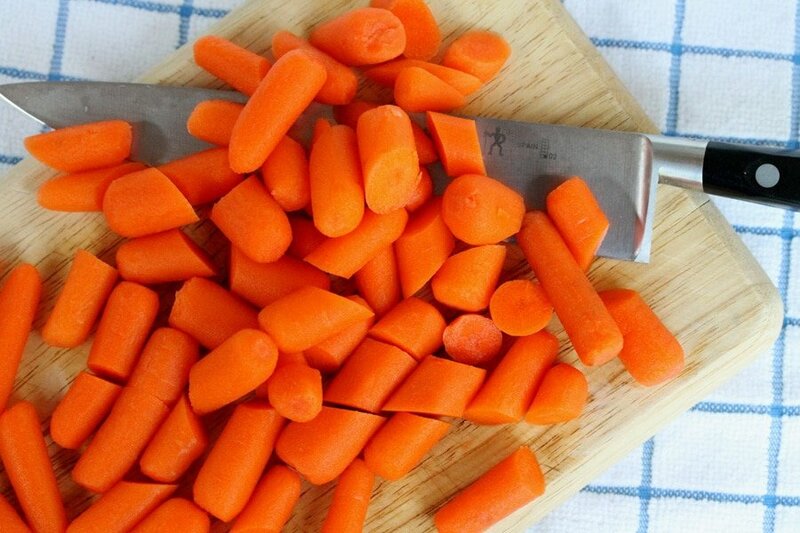 Cut the larger size carrots in half. Otherwise, if the carrots are smaller just leave them whole. 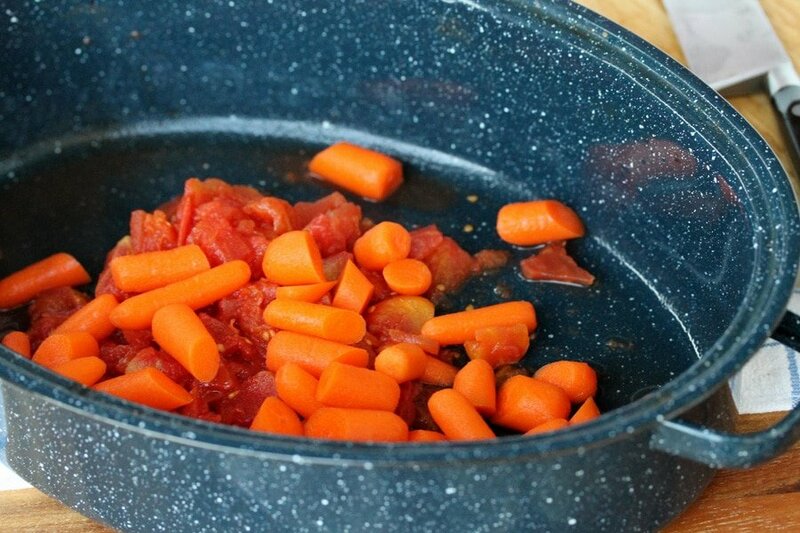 To the pan, add the carrots. 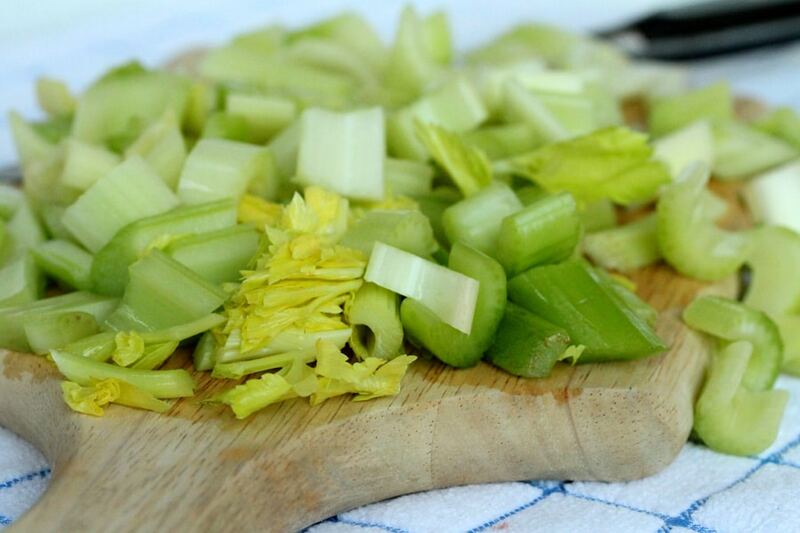 Cut the celery in fairly large pieces (about 1-½ inch pieces). I also like to include the pieces of celery from the heart section with the leaves. 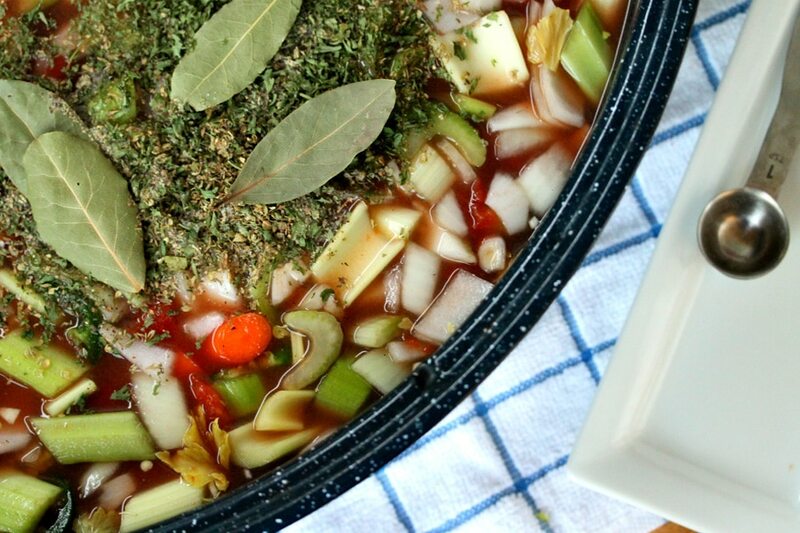 The leaves are so pretty in the stew. 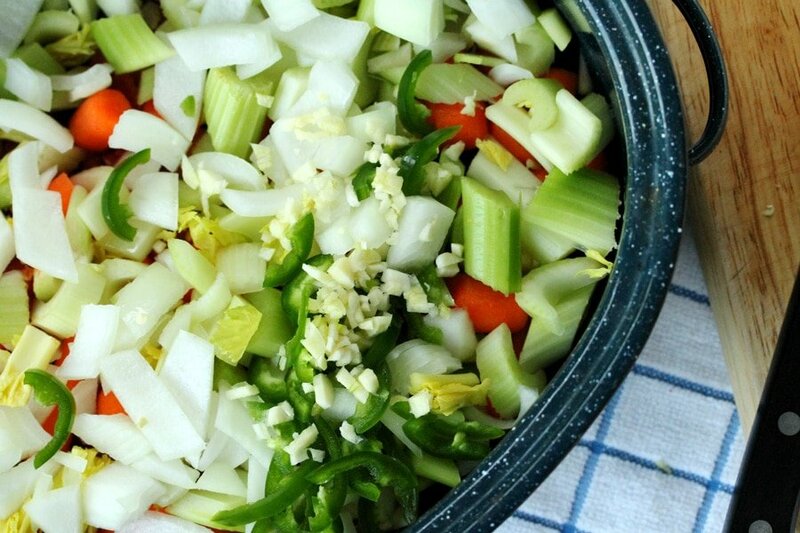 To the pan, add celery. 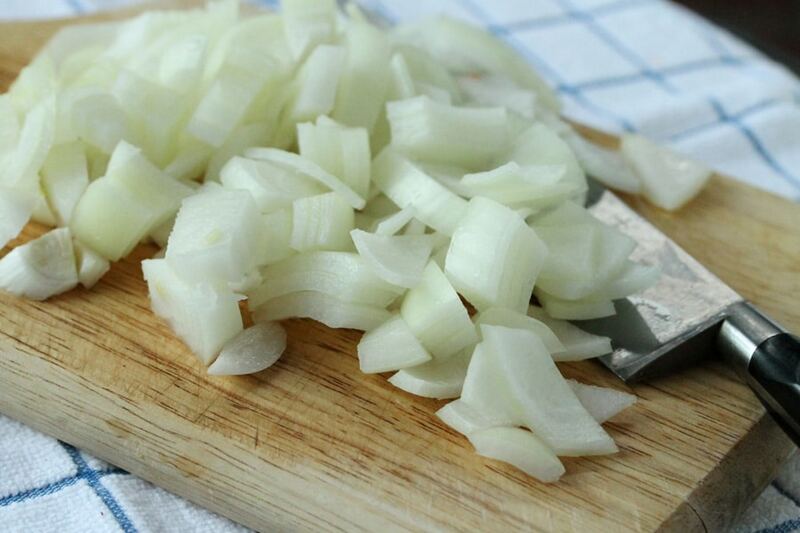 Cut the onions in about the same size pieces as the celery. Dice the garlic. 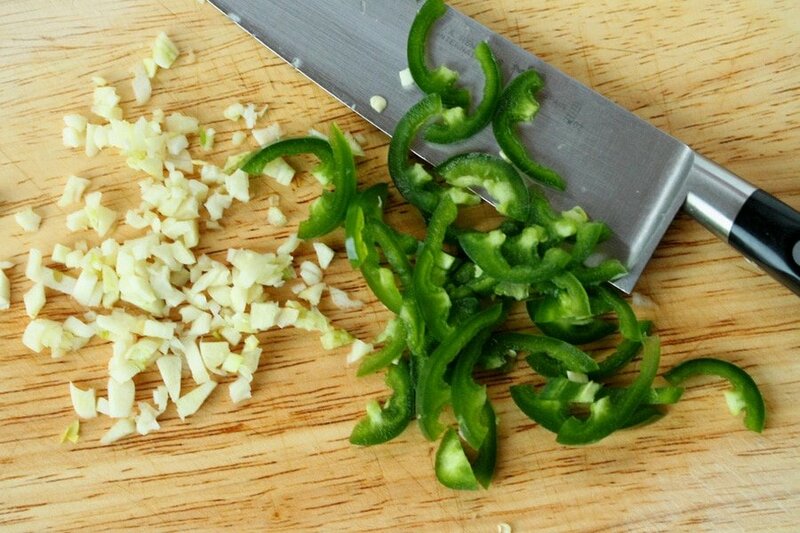 Then cut the jalapeno in half lengthwise, remove the seeds and cut it in thinly sliced pieces. Add the garlic and jalapeno. 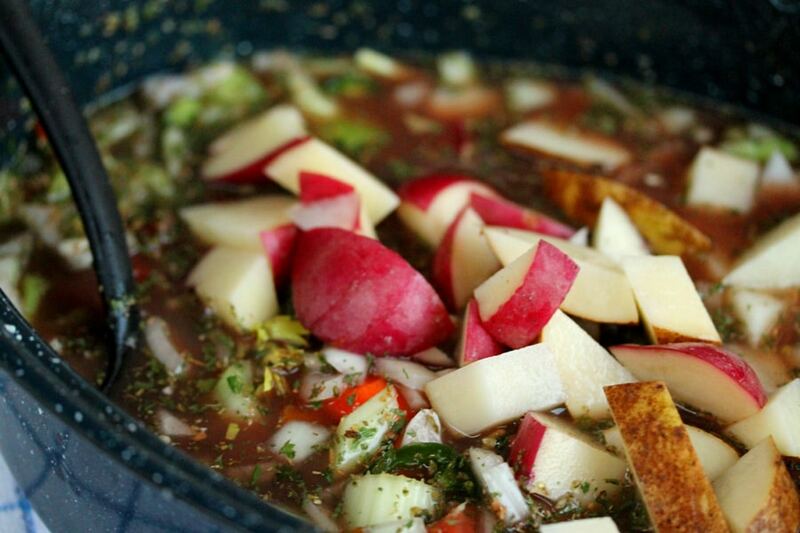 Next, add the beef stock. 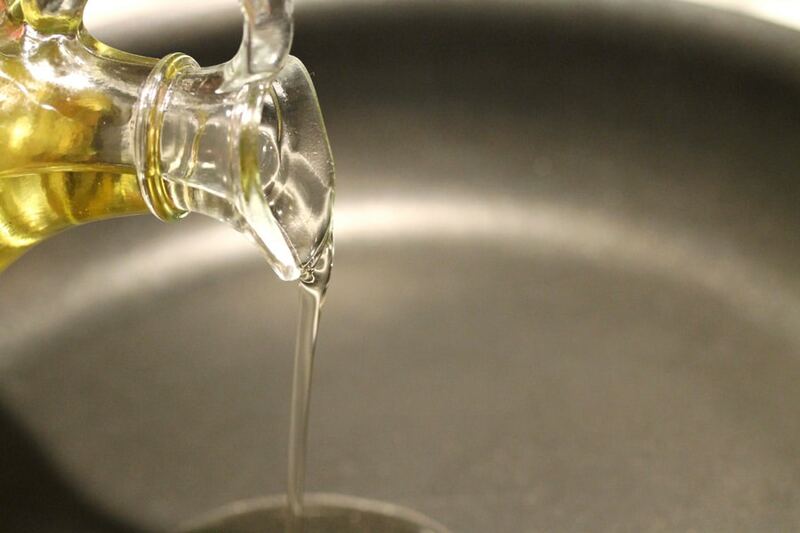 Here’s what it will look like with all of the stock in the pan. 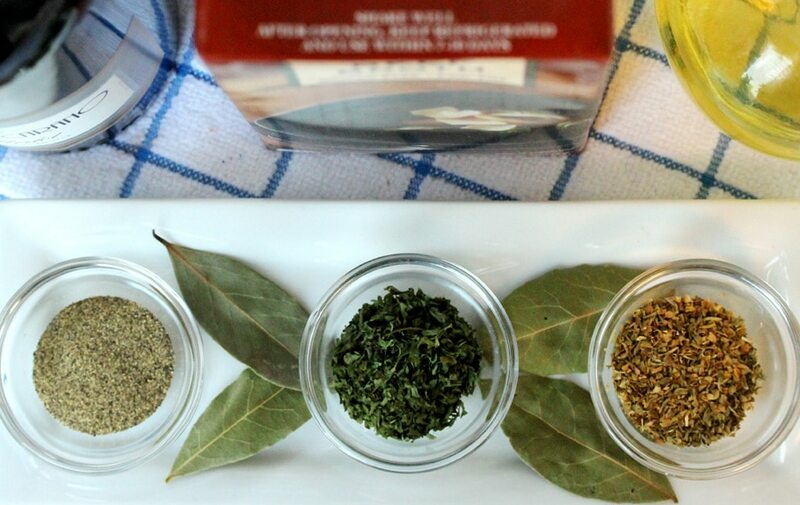 Next, add the dried oregano, pepper, parsley, bay leaves, and salt. 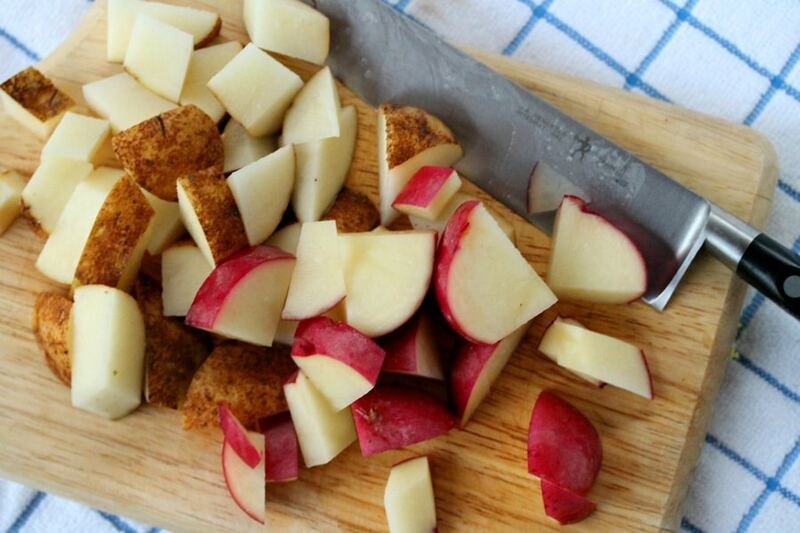 …so next, cut the potatoes (with the skin on) into fairly large pieces (about 2 inch pieces). I just happened to have both russet and red potatoes on hand, but feel free to use whatever potatoes you have available. Then to the pan, add the potatoes. 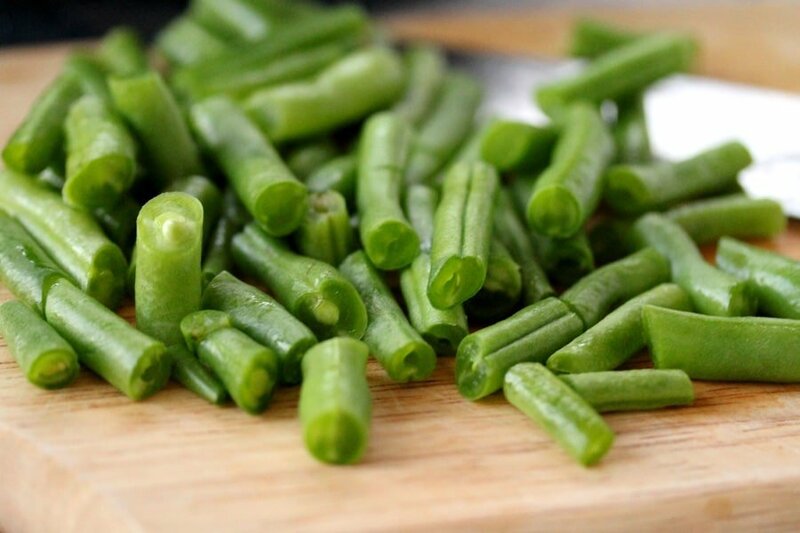 Next, cut each green bean into 3 or 4 pieces depending on the length of the green beans. 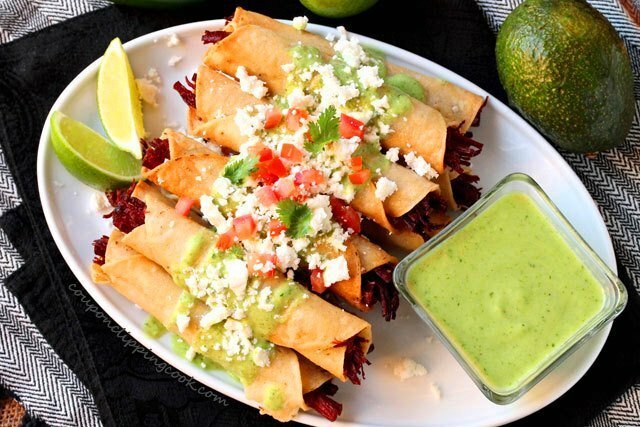 Or, you can use a can of green beans instead. 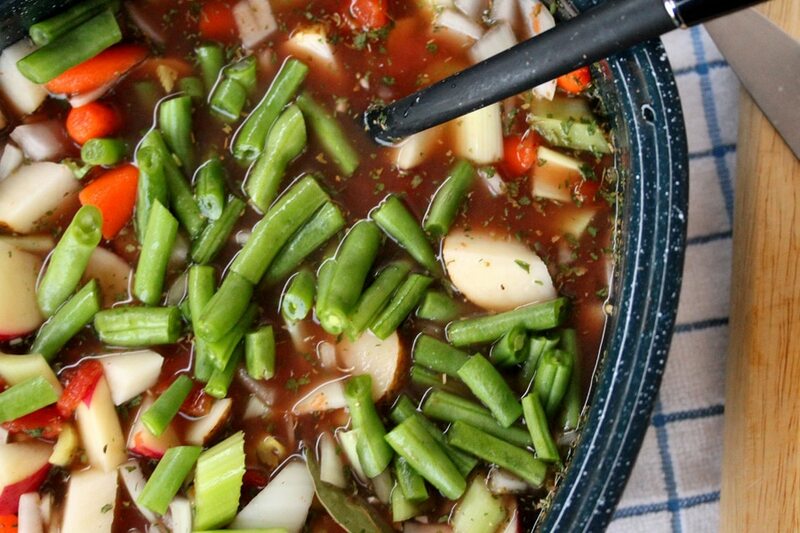 Add the green beans (if using canned green beans, drain out the liquid first). 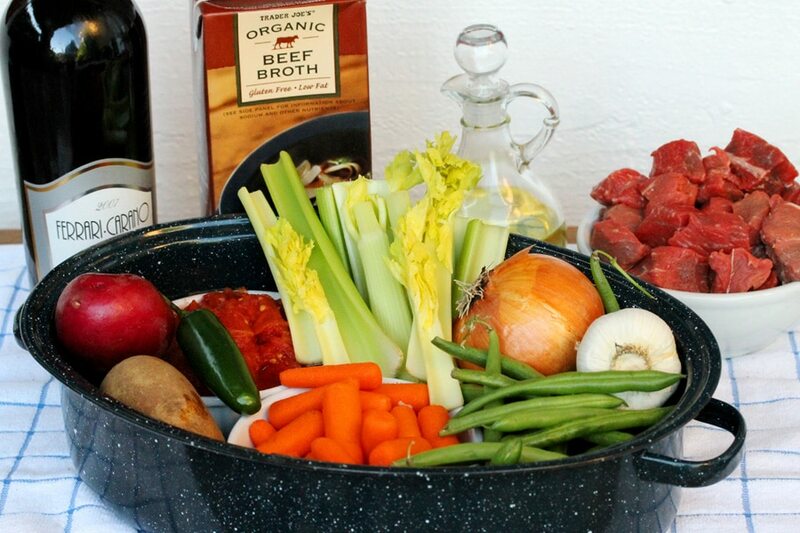 Stir the ingredients in the roaster pan together and set aside to marinate while browning the beef stew meat. 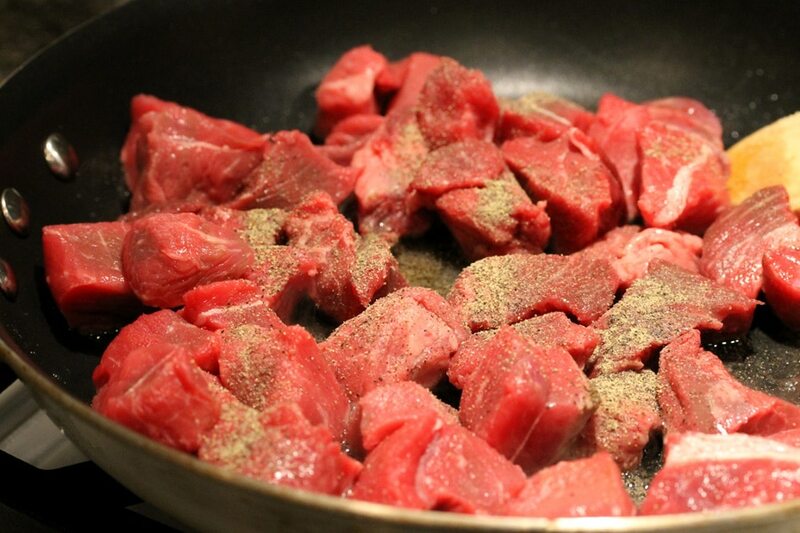 To the pan, add beef stew meat and a few dashes of pepper. Cook the beef just long enough so that it browns on each side. It takes about 7 minutes for the meat to get brown. Next, add the browned beef into the roaster pan (including the olive oil and meat juices that may still be in the skillet). 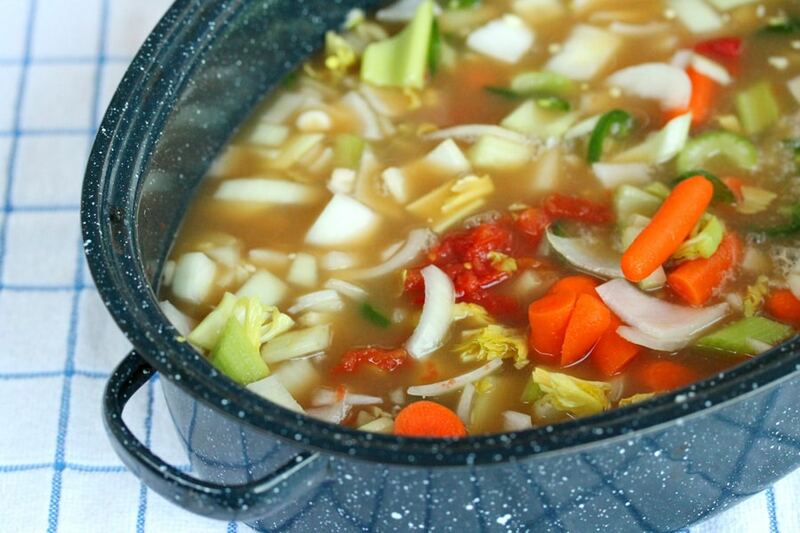 Stir all of the ingredients together, and cover the roaster pan with a lid. Then bake in a preheated oven until the meat is so tender you can cut it with a spoon (about 2 hours). 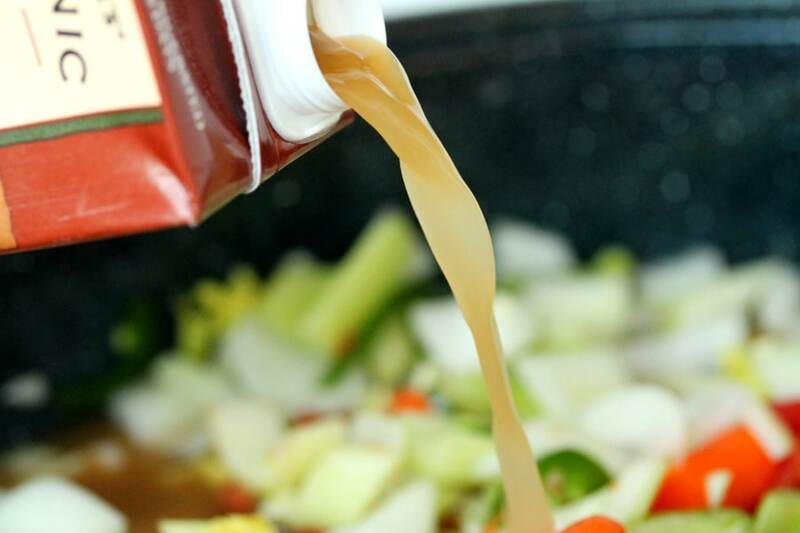 If more liquid is preferred in the stew, stir in a little bit of water. 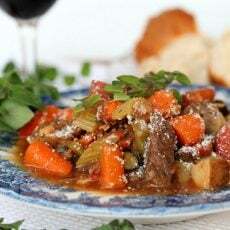 To serving bowls, add the warm stew and top with grated Parmesan cheese. 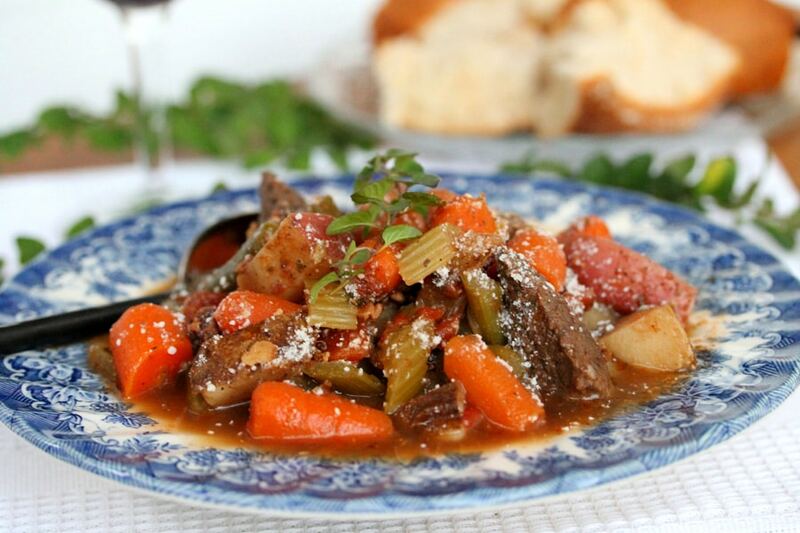 A hearty true comfort food one-skillet meal. 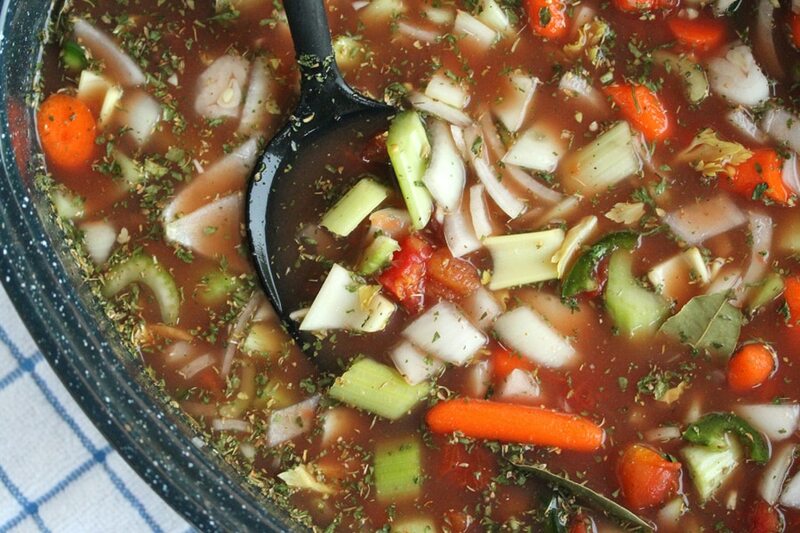 To a large roaster pan, add the tomatoes, carrots, celery, onions, potatoes, green beans, garlic, jalapeno, beef stock, wine, dried oregano, pepper, dried parsley, bay leaves and salt. Stir together. 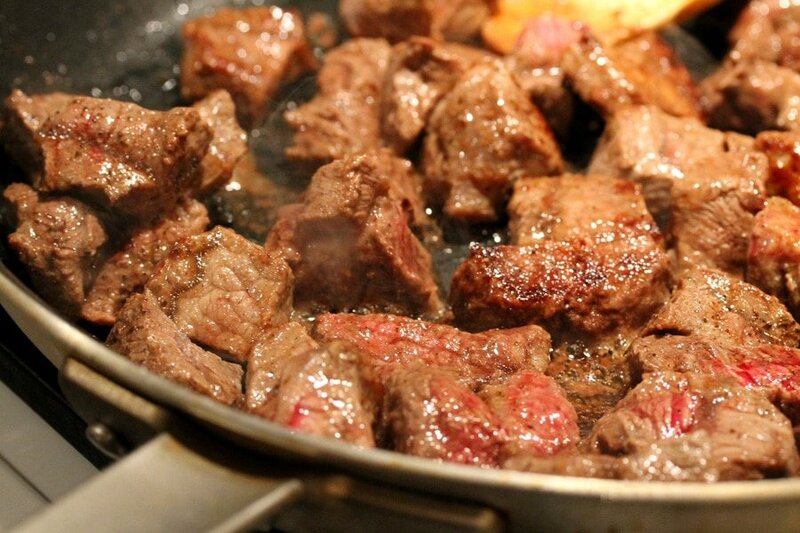 Set aside to marinate while browning the beef. 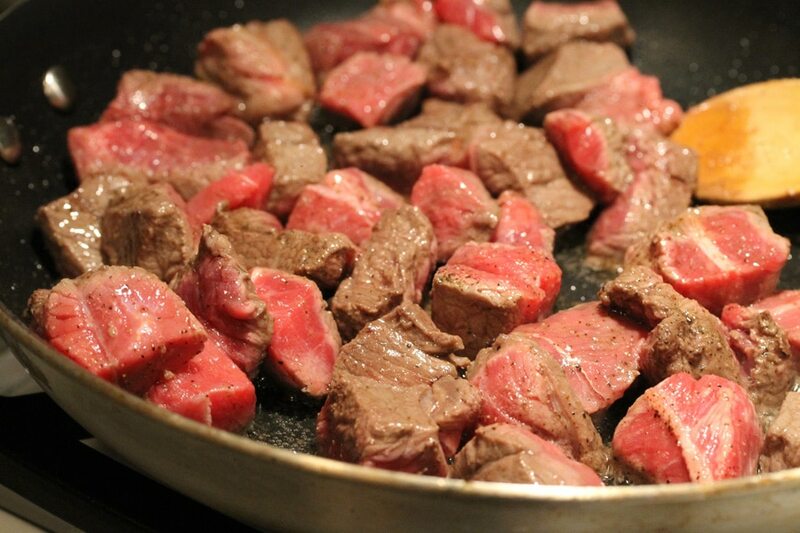 Browning the Beef Stew Meat - Heat a skillet on medium heat and add olive oil. Add the beef and a few dashes of pepper. Stir. Cook the beef just long enough so that it browns a bit on each side. 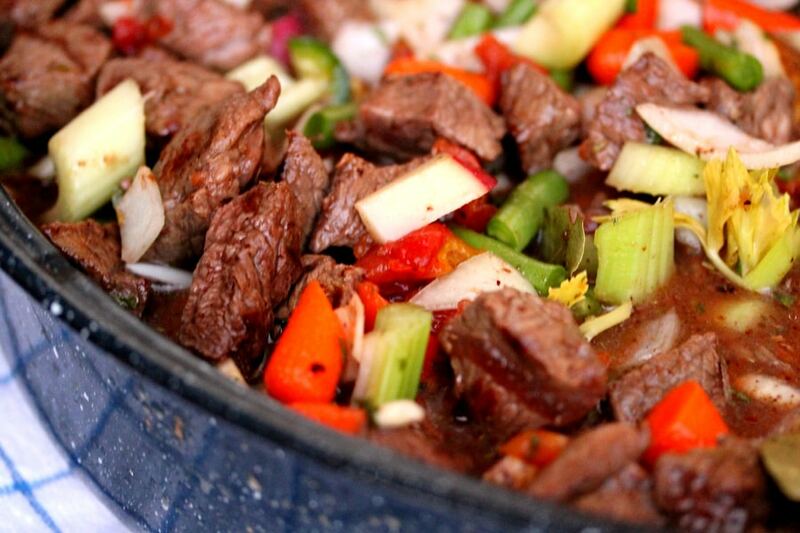 To the roaster pan, add the beef (including the olive oil and meat juices that may still be in the skillet). Cover the roaster pan with a lid and bake in a preheated oven until the meat is so tender you could cut it with a spoon (about 2 hours). 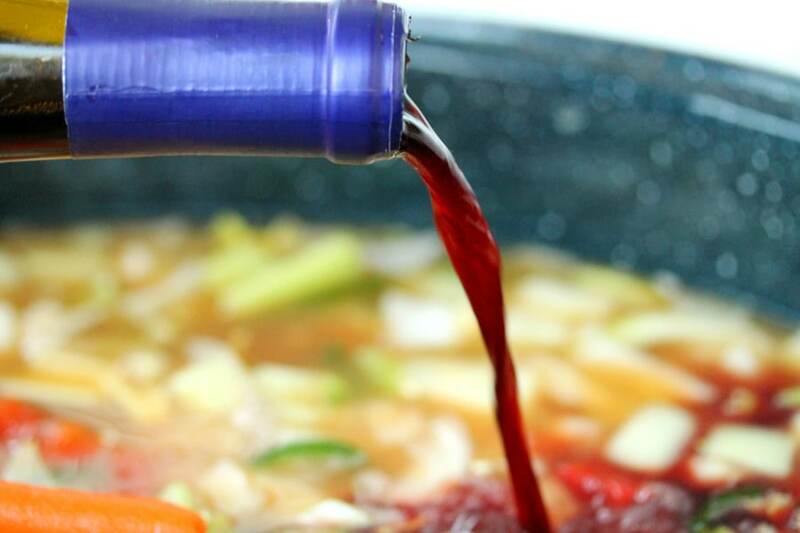 If more liquid is preferred in the stew, stir in a little water.